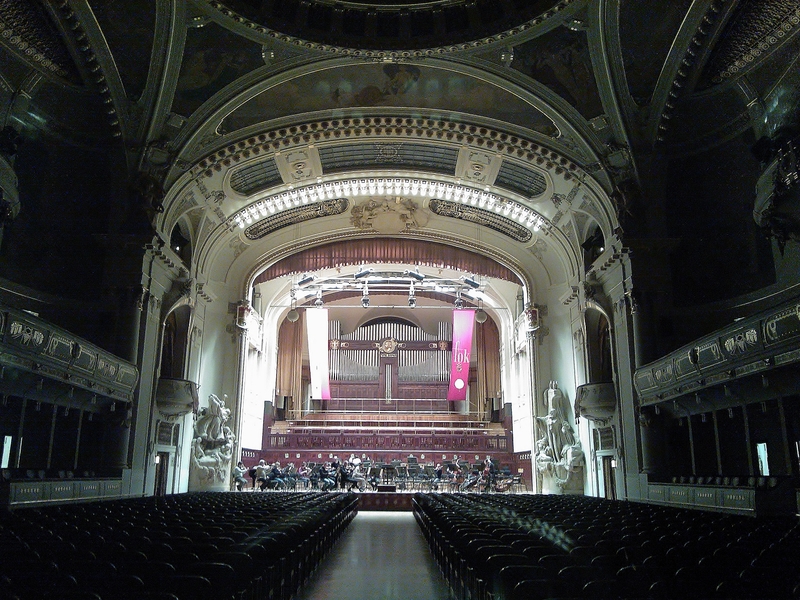 Musicians of the Prague Symphony Orchestra FOK are preparing for a concert in the Smetana Hall of Municipal House in Prague. Taken about 30 minutes before the concert’s beginning (hence the empty seats and dimmed lights) through the big glass concert hall door through which we were going to be let into the hall to enjoy the beautiful musical event. So the standpoint for this photograph is on an actual THRESHOLD of a great cultural experience. And the concert itself was marvelous and lots of fun, indeed! 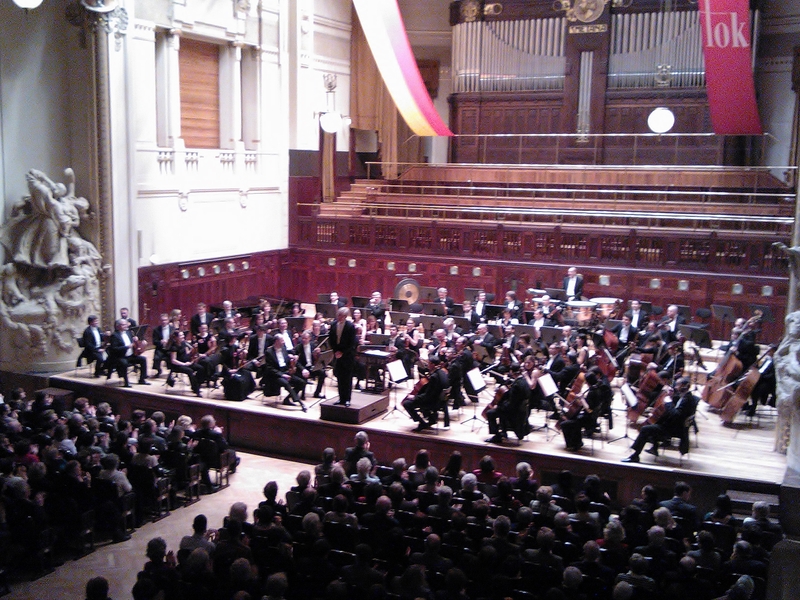 This entry was posted in Life/Photography and tagged Bedrich, Classical Music, Concert, Concert Hall, Czech Republic, Hall, Municipal House, Musicians, Obecni Dum, Orchestra, postaday, Prague, Recital, Smetana, threshold, weekly photo challenge. Bookmark the permalink. Really nice shot. Beautiful concert hall. Was this a rehearsal? Thank you! :-) I think rather a short warm up for the musicians shortly before a regular concert. No problemo. I am happy to answer anyways! :-D Peace! Wonderful shot! And you can’t even tell that it’s taken through a glass door at all! Thank you so much! :-) Yes, I was really literally at the threshold here, clung right on the glass with my camera! LOL! Very nice! You can almost feel the anticipation. This is gorgeous, I can’t believe you caught such a great shot through a glass door! What a great theatre, I bet it was wonderful. Thank you very much. Yes, it was! Nice. I would have loved to hear the concert. Thank you! :-) I am sure there’s a classical music recital or opera on somewhere near you, too. Just buy the tickets and off you go enlighten your soul and mind with beautiful sounds and melodies. :-D Cheers! That’s true. There’s always something happening at the Oslo Opera House. Its magnificent ! I love big halls and corridors. Loved it ! I know, right? Me too! :-D Thank you for stopping by! :-) Peace. would love to have been there to hear them play – and I like how you gave us two photos – the down view of the orchestra was a nice touch – along with the great majestic theatre view…. Definitely worth it! :-) Thank you for stopping by and commenting! I am such a lover of all things musical and all things on stage! This is such a great shot :D Made me wish I could have heard the concert! It does have the feel of something great about to happen. Such a beautiful shot! That looks spectacular! What a lovely event for you! Hi psychosomaticallyinlove. wonderful love classical music. Went to a concert in Venice three years ago. Thank you for liking ‘On The Edge!’ The Foureyed poet.